My card today is for a challenge I do with a couple of friends of mine. Each month we challenge each other to create something using supplies we all own. This month our challenge was to create a Shadow Box card. I have been having fun this year using the Lawn Fawn Shadow Box Card die set and adding it to the centre of a card, so I decided to use that again to create my card. 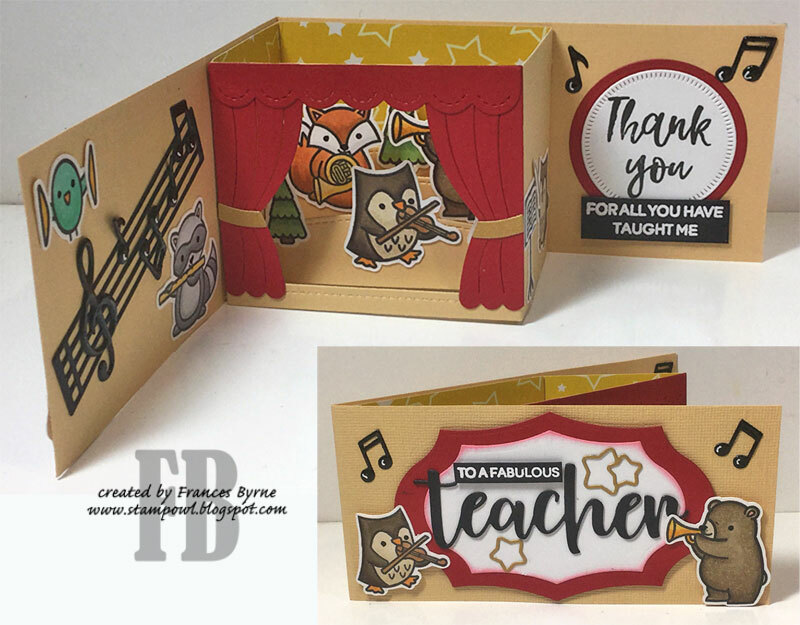 I am still trying to get some cards made as teacher thank you's for my Grandchildren's teachers and today I decided to make a music themed card for the Music Teacher who is teaching my grandson to play the Cello. You can see my previous cards here. The finished size of my card is 14.8cm (5 7/8inches) x 7cm (2 7/8inches), I was able to use Australian A4 card, however if you are in the USA you would probably need to use 12 inch cardstock. 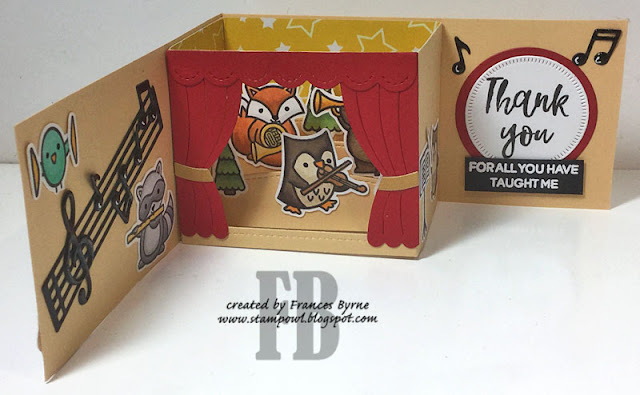 I also used the Lawn Fawn Shadow Box Theater Add On die set to add the curtain to the front of the shadow box. 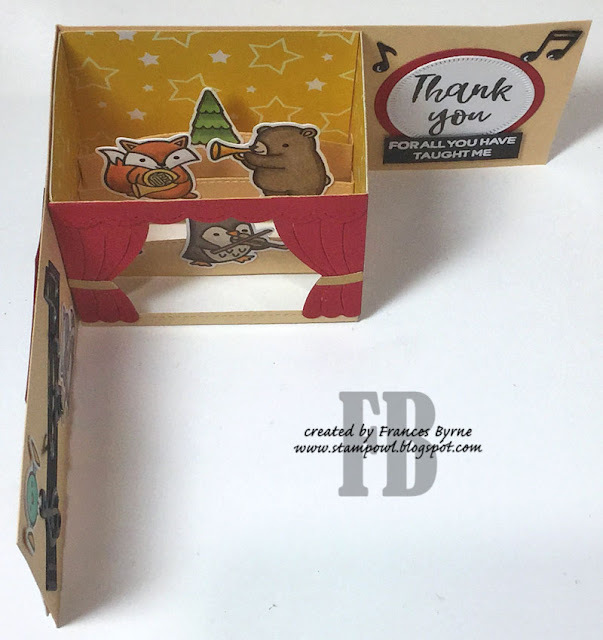 To decorate the card I used the Concert Critters & Jump for Joy stamp sets from Lawn Fawn. 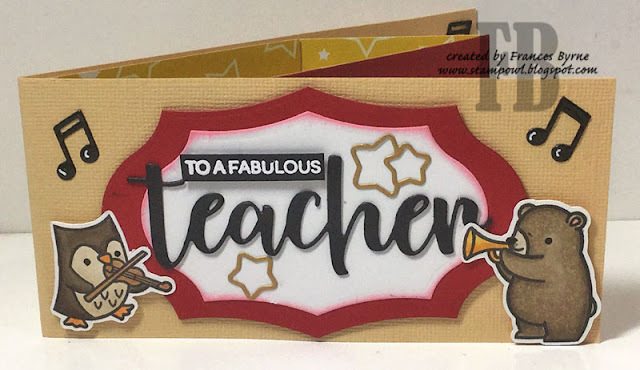 The music notes on the left side of the card is also from Lawn Fawn. 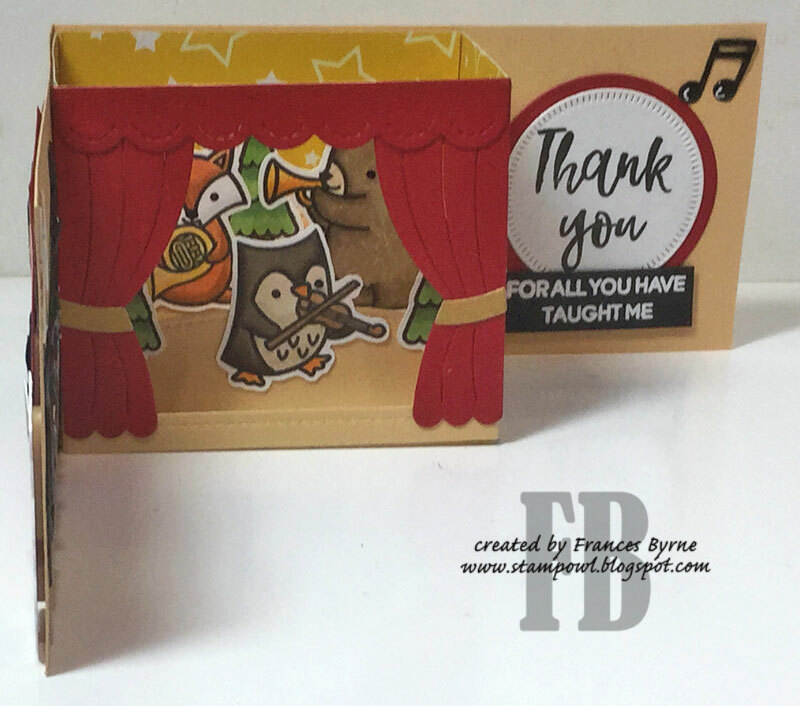 The thank you sentiment on the right hand panel of the card is from a Heffy Doodle stamp set. Here is a overhead view of my card so you can see some of the images inside the shadow box a little better. These can be hard to photograph. For the front of the card I used the Honey Bee Stamps Special Teacher die set, I also added a few more of the animals from the Concert Critters stamp set. The label is from an old retired set I have in my stash.